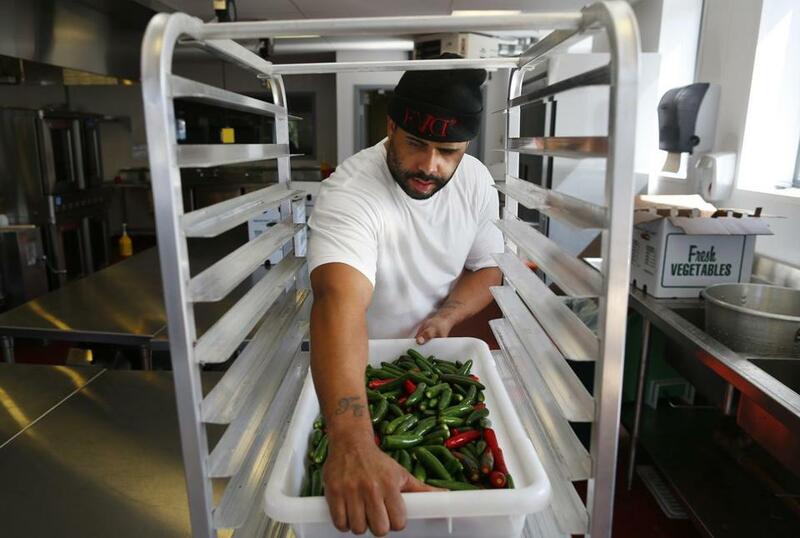 CropCircle Kitchen employee Jackson Barros prepped jalapenos for Alex’s Ugly Sauce. Boston’s newest startup incubator features some impressive equipment, but instead of laser cutters and three-dimensional printers, the shared workspace boasts a 40-gallon skillet and an oven the size of a bank vault that can bake 480 cookies at once. The nonprofit CropCircle Kitchen Inc. will cut the ribbon Monday on a $14.5 million culinary wonderland on Quincy Street in Dorchester. Dubbed CCK Pearl as a nod to the renovated building it occupies — the former Pearl Meat factory — the incubator will provide industrial-grade kitchen space to as many as 30 fledgling businesses, including food trucks, bakeries, and salsa makers. The idea is to give entrepreneurs who might otherwise work out of home kitchens access to tools to speed production and help grow their businesses faster. The original CropCircle Kitchen, launched in Jamaica Plain in 2009, already has spawned successful companies that outgrew the space. Clover Food Lab, known for vegetarian fare, worked at CropCircle during its startup phase and now operates five restaurants and seven food trucks. Roxy’s Grilled Cheese, another popular food truck business, used CropCircle for preparations before opening a restaurant in Allston in May. With 10,000 square feet of kitchen space, CCK Pearl is roughly three times bigger than the Jamaica Plain facility. It was funded by grants from charities and public agencies, including the state Department of Housing and Economic Development; and the Boston Foundation; and by tax credits and loans from Boston Community Capital and the city of Boston. 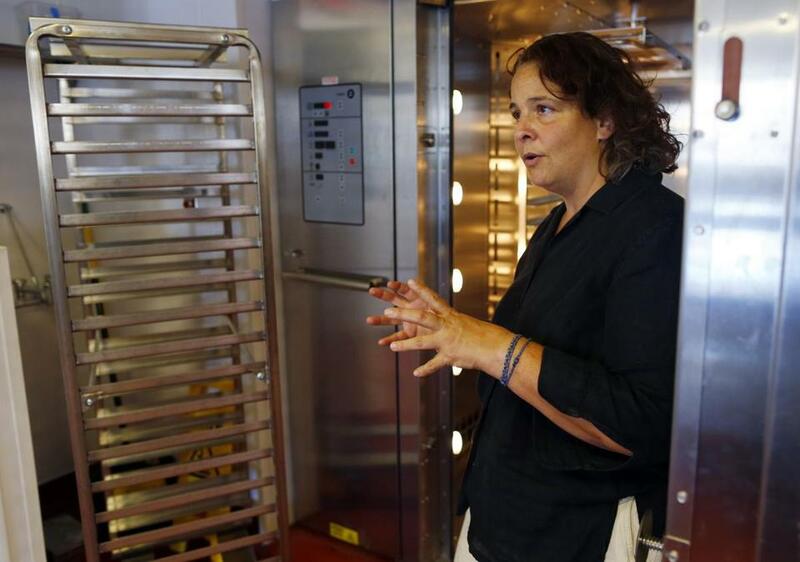 Executive director Jen Faigel showed off one of the ovens, which are the size of a bank vault and can bake 480 cookies at once. Several businesses started using the kitchen during a soft launch period this summer. Owners and their staffs generally don’t work there full time. Rather, they must apply for membership in the incubator and reserve kitchen workstations by the hour. A $350 monthly membership includes 10 hours of kitchen time. Additional time can be reserved for $35 an hour, and businesses can pay to store food at the site. CCK Pearl also offers eight private stations that larger businesses can rent for full-time use. Food truck owners are among CCK Pearl’s first members, attracted by a spacious, stocked kitchen they can use to prepare large quantities of ingredients more easily than they could on the road. Sean Clarke and Maximilian Runge, cofounders of Walloon’s Food Truck, used CCK Pearl last week to cut and blanch 40 pounds of french fries in a single afternoon — a volume they said they could never match in their vehicle. 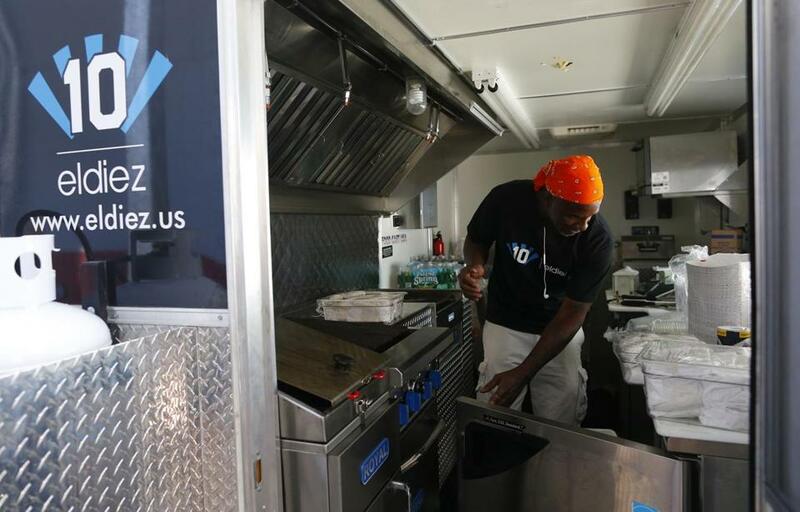 At the station next to them, a four-person team from El Diez Argentinian Grill was getting ready to take the company food truck to Massachusetts General Hospital later in the day. Workers filled and crimped empanadas, then wrapped each one in parchment paper to keep them from sticking together. All the workers would have to do in the truck is drop the semi-circular pastries in a fryer as orders came in. Other than rental fees, the only obligation for CCK Pearl members is to clean up their stations and leave them as they found them. Touring the kitchen on a recent day, Faigel shook her head and laughed at one deep fryer in which oil had been left undrained. She was willing to cut the offending entrepreneur slack — this time. El Diez Argentinian Grill employee James Long, 43, loaded up a food truck after prepping the food in a shared kitchen.